Dogs and other pets are a huge part of our lives. We share our homes with them. We buy them toys, food and even special beds. But, did you know that pet dander is one of the most common allergens and that even if you have never had a pet of any kind in your home, you may have problems with it. Every time you walk our your front door you interact with countless other people. Some of those people will have pet dander on their clothes. You sit on buses and in cabs after people with pets. You are surrounded by it every day and where does it end up? That’s right. It’s in your house. So, as hard as you have tried to make it a pet-free zone, your home still has pet dander. Choosing the right air purifier will help you breathe easier by removing the pet dander you didn’t even know you had. 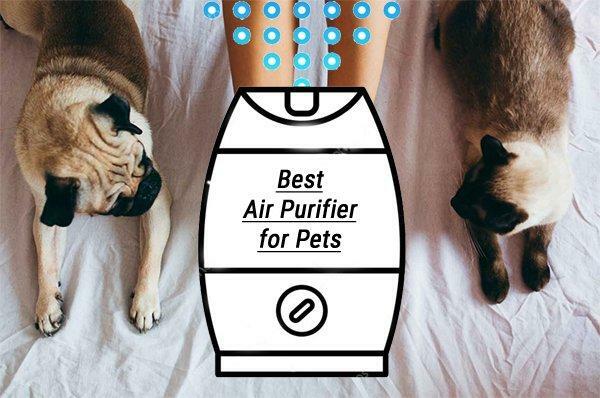 For pet owners, the challenge is to find an air purifier that can keep up with the constant shedding plus the odor that comes with even a small dog. 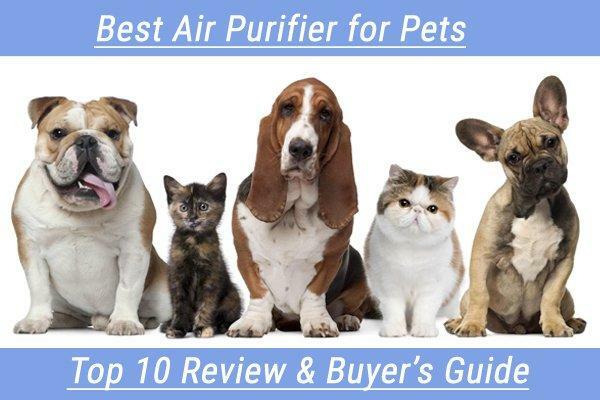 This is a review of some of the top air purifiers that are specifically listed for pet’s and their hair, odor and dander. At just 22″ wide, this small but powerful air purifier promises to get rid of up to 99.97% of dust and allergens as small as .3 microns. A charcoal filter takes care of the odors and an optional UV-C light helps to destroy any airborne bacteria, virus or mold spores. Energy Star certified and AHAM verified, this tower style air purifier uses a three step process to handle even the toughest air conditions. The Germ Guardian AC 4825 is Available in either white or gray. Air purifiers are rated based on their “CADR” which is the clean air delivery rate. The higher this number is, the faster the air is being cleaned and returned to the room. The Germ Guardian AC 4825 has a CADR of 118 for dust, 125 for pollen and 108 for smoke. It is best for use in a room of around 167 square feet and circulates the air in the room around 4 times per hour. In a small area, the Germ Guardain AC 4825 does a good job, however it is not meant for larger or more open rooms. Keeping that limitation in mind, yes, it is recommended. Small size does not take up a lot of room. Option to use the UV-C light or not. Filter change indicators let you know when to change your filters (Roughly every 6-8 months). Only good for a small room. Several units have been noted to smoke or spark and could be a fire hazard. With a true HEPA filter plus the addition of four premium activated charcoal filters, the Veva 8000 Elite Pro Series air purifier is able to reduce pet dander, odors and other allergens from the air down to 99.97% for a room of up to 325 square feet. The fan has three speeds from quiet to turbo and the unit is 100% ozone-free. 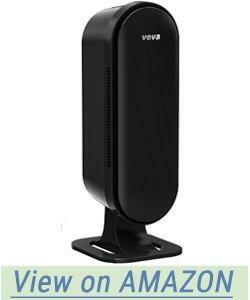 The Veva 8000 Elite Pro Series air purifier comes with a 2-year warranty but lifetime support from Veva. In addition to ridding your room of odors, pet dander, dust and more, the Veva 8000 Elite Pro Series has a unique safety feature that makes it a better choice for use in rooms where small children may be playing. If the front panel is not installed completely and correctly, the unit will not turn on. If the front panel is jostled loose during use the unit will automatically shut itself off until the panel is replaced and the unit is reset. Great for small to medium sized rooms like bedrooms, the Veva 8000 Elite Pro Series can be on the loud side which may take some getting used to. However, it works well and is worth the effort. People who are used to sleeping with fans running or other types of noise may not even notice it at all. Good for rooms up to 325 sq. feet. Safety feature is reassuring to people with curious pets and small children. Unit is moderately to very loud especially on turbo speed. The design is a little strange. The AeraMax Large Room Air Purifier is meant to clear the air of pollen, dust, pet dander and other allergens in rooms up to 600 square feet making it one of the most powerful on the market in the mid-price range. It is also one of the only models to have been certified by the Asthma and Allergy Foundation of America. It has a 4 stage air purification system meaning it can handle pet hair, pet dander and pet odor with no problem. A smart sensor monitors your air quality and automatically adjusts the fan speed as needed. The AeraMax Large Room Air Purifier has a special higher performance mode which is meant to be used during allergy, cold and flu season. The American Lung Association calls pet dander one of the biggest triggers for allergies, so a house with pets may need to use this special feature more frequently. 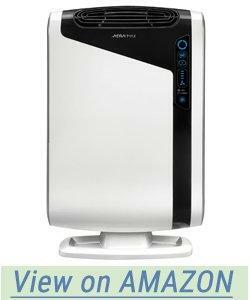 If you need an air purifier in a large room plus you have pets, this is definitely a model that you should consider. It can purify up to 600 sq. feet and is even certified by the Asthma and Allergy Foundation of America, a non-profit that provides valuable information and tips to the more than 50 million people who have some type of allergy. Products can request certification but must meet strict standards to receive it. Special high performance mode can help deal with allergens as well as the germs, bacteria and viruses that cause the spread of cold and the flu. Smart sensor to monitor air quality. Unit can be noisy especially at higher speeds. The unit can have a strange smell during use. Most air purifiers have 2 or 3 stage filters. They do an okay job for some things and fail at others. Some air purifiers move up to four stage filtration and improve on performance dramatically. But, the Winix WAC9500 Ultimate Pet True Hepa Air Cleaners has a five-stage filtration system to knock pet odor, pet hair and pet dander out of your home to the tune of a reduction of 99.99% of all airborne pet hair and dander. The washable advanced odor control carbon filter was specifically designed by Winix with pet odors in mind. The filter can handle smoke, cooking, and other household odors as well. The first stage is a fully washable pre-filter. That stage traps the largest particles including dog hair and more and holds it there until it is washed away. The next stage is the True HEPA filter to reduce allergens, pet dander and more. The third stage is the CleanCel anti-bacterial treated filter to kill germs and bacteria. The fourth stage is the advanced odor control granular carbon filter which is meant to destroy even the toughest odors in your house. Finally, air passes through the Winix Plasma Wave technology filter which is meant to attack all pollutants at their molecular level to neutralize viruses, bacteria, remaining odors and VOCs. The Winix WAC9500 Ultimate Pet True HEPA Air Cleaner was independently tested and found to work well up to 280 sq feet with a CADR of Pollen (194), dust (182) and tobacco smoke (183). It can be controlled either manually or by remote control with fan speeds ranging from low to turbo. The lights dim automatically during sleep mode. There is a LED filter change indicator light as well. Fairly quiet even on Turbo speed and strong enough to handle pet hair, dander and odor,this is a good air purifier for pet owners or for those that have tough issues in their home. It has a pretty decent CADR for pollen, dust and tobacco smoke which is often one of the things that trips up other air purifiers. Five stage filtration system gets most odors and allergens without a problem. Washable filters can help reduce the number of other filters you are buying. Plasma Wave technology brings peace of mind during cold and flu season. While the unit itself is fairly priced the filters are extremely expensive and very difficult to find. Customer service is not the easiest or most caring to deal with. 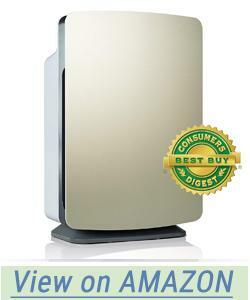 The InvisClean Aura Air Purifier has a powerful motor but is still designed to be completely energy efficient. It is able to clean and replace twice the amount of air while still using 82% less energy than similarly sized units. For a room of about 320 sq. 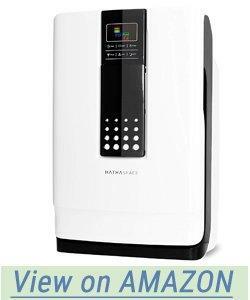 ft. the InivisClean Aura Air Purifier has a CADR of 170 CFM (cubic feet per minute). It uses a 4 stage filtration system and features an optional ionizer as well. Sleep mode runs quietly and without any lights. You can set the unit to run on a timer for 2, 4 or 8 hours or use it continuously for rooms where pets spend most of their time to stay ahead of the pet dander, hair, and odor. If you choose to use the ionizer you do so by hitting a button. 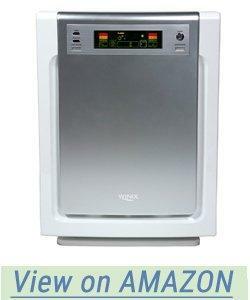 The ionizer than releases negative ions into the air. These ions will attract small particles to one another forming larger clumps which are then more easily trapped in one of the stages of the air purifier. 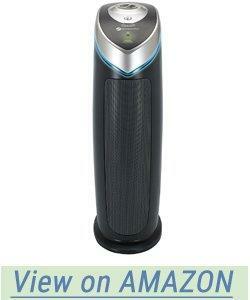 This air purifier also has a UV-C light that helps to kill bacteria, virus, and mold. 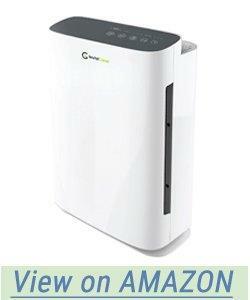 If you are worried about high energy bills with other air purifiers but still want better air quality this may be the unit for you. It is moderately priced, the filters are easy to find and to replace and there is a 3 year warranty backed with life time support from InvisiClean. Powerful motor with reduced energy usage. 4 stage filtration system including a True HEPA filter. Optional ionizer with in-use light. UV-C light is also independently operated. May not be entirely durable. Tipping the unit over may cause it to fail. Some units have been reported as only lasting for 4 months or less. The Alen BreatheSmart Classic Large Room Air Purifier has several color panels (16 in all) to choose from so that it always looks right in any room you need it. There are also several model options for the types of pollutants that it will be needed for such as the Pet and Diaper Odor model. It is meant to work in a 1100 sq. ft. room and uses Whisper Max which makes it two times quieter than the competition. There are 4 filter options which allow you to buy based on your particular needs. The Alen BreatheSmart Classic Large Room Air Purifier has been Energy Star Certified and uses about as much electricity as a lightbulb. It has three-stage filtration and more importantly, a lifetime guarantee for worry-free operation. If you have a large room or an open floor plan this might be the best option for you needs. The changeable color panels are certainly a nice touch as is the ability to choose a filter that works on the problems most pertinent to each user. Color panels lets this unit fit in with the decor in virtually any room of the house. Cleans the air in a 1100 sq. ft. room every thirty minutes. Filter option specifically designed for pet and diaper odor is a huge plus. The company offers a lifetime warranty but is fairly slow to respond when there is a problem. Some units may not meet their stated purposes as well as you would hope for this pricing level. 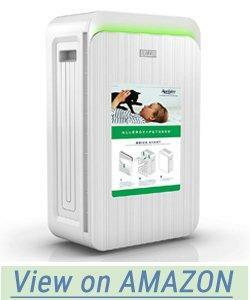 The Aprilaire Allergy and Pet Air Purifier are one of the three options offered by the company. The other two are Allergy and Clean. The Allergy and Pet option can handle nearly 500 sq. ft. and eliminates up to 99.97% of the dander, odors and other allergens that are released in to the air on a daily basis. The four-stage filtration system plucks pet hair out of the air, filters out smaller contaminants and even eliminates tough odors. The four stages include: a pre-filter, a fine pet hair, and dander True HEPA filter, an alumina oxide filter for smaller particles and an activated carbon filter to get rid of the odors. This unit is 100% ozone-free. The Aprilaire Allergy and Pet Air Purifier has 6 fan speeds to choose from and several modes that make purifying the air automatic. The fan speeds range from low to turbo and can be set to work on a Sleep mode, Smart mode or Event mode. You can also choose timed functions if you would prefer. Smart mode monitors the air quality and adjusts the fan as needed. Sleep mode sets the speed to low and dims the lights. The Aprilaire Allergy and Pet Air Purifier also features a child lock, a filter life indicator and an air quality light bar. Filters should be changed every 6-8 months depending on use and conditions. There is a 1-year warranty on this unit. Designed specifically for pet hair and dander, this it a small but powerful unit with the ability to clear the air for a room up to 500 sq. ft. It has a four stage filtration system and a number of convenient functions that make it super easy to use. Lots of functions and modes to make use easier. Effective up to 99.97% in rooms up to 500 square feet. 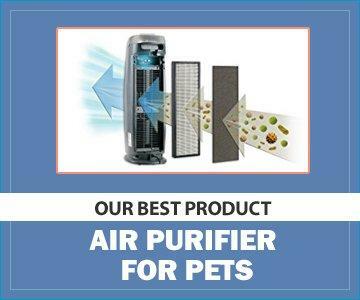 Four stage filtration system eliminates pet hair, dander and odor. It is expensive and is the highest price model of the three choices for this brand. The limited warranty is only 1 year. The unit starts off strongly and then starts to falter toward the end of its first year of service. The HathaSpace Smart True HEPA filter is different from others on the market because it is not a four or five stage filtration unit. It is a 6 stage unit. It has 3 fan speeds, a 1 year warranty with lifetime support plus a 60 day, money back guarantee. If you aren’t fully satisfied in your first 60 days of use, you can return the unit and get your money back. The HathaSpace Smart True HEPA filter starts with a cold catalyst filter. The second stage is a cellular level, activated carbon filter which eliminates most of the most common household odors on the spot. From there the air is pushed through an anti-bacterial filter which kills off bacteria, germs, viruses and mold spores. The next level is the True HEPA filter. The final two stages are the UV-C light sterilizer which eliminates any of the nasty germs or bacteria that has survived up to this point and the ionizer. The ionizer sends out negative ions which react with the various particles in the air and makes them group together into larger, and easier to filter out clumps. The HathaSpace Smart True HEPA air purifier is a good choice for families on a budget who still want the cleanest air they can have. It is a relatively small unit but can handled the air in a room of roughly 300 sq. ft. The company has said that sleep mode with a super quiet fan and automatically dimmed lights will be released at some point. Priced far below other units with less filtration power. 6 stages of filtration is an industry game changer. Easy to set up and use, filters are easy to change. Filters should be changed every 6 months. The unit emits an odor which some describe as plastic burning. It fades but never goes away. The company has announced the dimmed lights sleep mode several times but have changed the date several times. The Pure Zone 3-in-1 True HEPA Filter Air Purifier is easy to set up right out of the box and works on either manual mode or timed mode. It has a three-speed fan, plus a three-stage filtration system for a CADR of 80 CFM. It is best for rooms of around 200 square feet. There is an option to use the UV-C air sanitizer. The filter should be changed in this air purifier every 6 months. Because of their basic design, most air purifiers are relatively noisy even on their lowest setting. 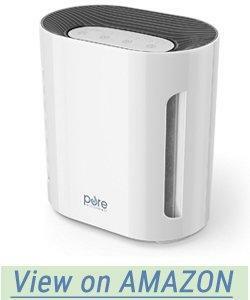 The Pure Zone 3-in-1 True HEPA Filter air purifier starts at a decibel level of 30 on the low setting. It is 40 decibels at medium and 50 decibels at the highest fan speed. For reference, 50 decibels is comparable to a normal conversation in your home. While this is a very easy to use and quiet to operate unit, it is also very small. The fan is so quiet because it does not seem to be very powerful and does not move a lot of air with a CADR of only 80 CFM. If you accept that it will probably be very limited in what it could do or you plan to use it in a very small room, it is fine. Otherwise, there are similarly priced units that can move much more air. You will be giving up on the quietness, however. Super quiet even on the highest setting. Timer lets you choose how long the unit runs from 2-8 hours. Very small unit with a weak fan. CADR is very low for this unit. The unit may have a plastic type smell during operation. 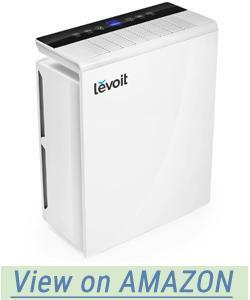 The Levoit LV-Pure 131 Air Purifier is capable of handling the air purification for a room of around 320 sq. ft. with a CADR of 135. It is Energy Star certified and has been FCC/CE approved. You get a 2-year warranty with lifetime support with a company that has a very good customer service track record overall. 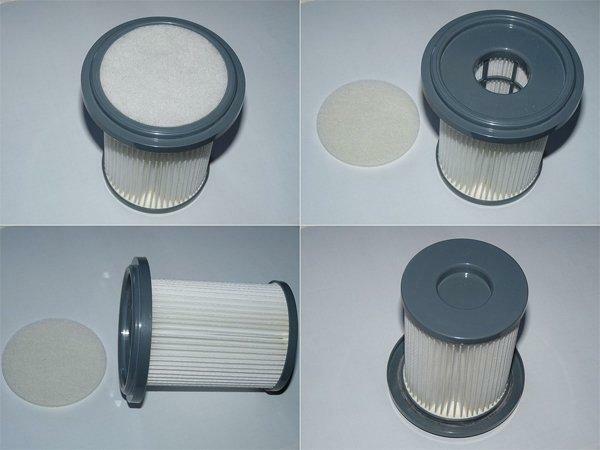 Filters last around 6 months, depending on conditions and amount of use. The Levoit LV-Pure 131 Air Purifier uses a pre-filter, a True HEPA filter and an activated carbon filter without UV or ions. Smart mode tests the air quality and then auto-suggests a fan speed to help purify the air in the room faster. Sleep mode automatically turns the fan to the lowest speed to reduce the noise level. At its highest speed the noise level for this air purifier is under 52 decibels or the equivalent of a normal conversation in your home. As a safety feature, the unit will not turn on or operate while the back cover is off. Energy Star certified to use less energy during operation and meant to work for average sized rooms, the Levoit LV-Pure 131 Air Purifier is a good choice at a good price. Customer service is quick to respond to questions, comments and concerns and can help you find resources for filters as well as help deal with any other problems even after the warranty period ends. CADR: 135. Rated for rooms up to 322 square feet. Fairly quiet operation even at the highest fan level. Filters may not last as long as indicated even under average use and circumstances. Some units have been sold as “new” but were clearly used. The Clean Air Delivery Rate is one of the most important factors. The higher that this number is the faster the air is being cleaned and replaced. The number is usually given as a numeric value in CFMs or cubic feet per minute. Every unit has a different CADR for different allergens and odors. Pay attention to how well the air purifier handles the toughest odors and allergens (including pet dander) because the others will not be a problem. In most cases, the higher the number of filtration stages, the better the air purifier will work. If one of these stages is not a True HEPA filter though, it may not really matter. Make sure that you read through the information for the various stages. At least one should be a carbon based filter for odor, a second stage should be the HEPA filter. Look at the numbers for effectiveness ratings as well. Air purifiers typically have between 2 and 6 stages of filtration with 3 stages being the most common. Some may have additional, optional stages that can be used as needed. These can include UV-C lights (which kill viruses, germs and bacteria) or ionizer units. Ionizers use negative ions to help clear the air by making particles larger and easier to filter out. Both of these however do cause a form of pollution on their own. Any air purifier that you consider will tell you approximately how many square feet it can effectively clean under average conditions. If you know that you are going to be presenting a challenge because you have more than 1 dog or you have dogs that shed all year round, use the suggested room size as a guideline only. For instance if your room is 250 sq. ft. the air purifier that you should consider should handle a minimum of 300 sq. ft to be even minimally effective. It is better to buy the more powerful purifier and then turn it down once it has managed the majority of the pet dander than to make a smaller unit struggle for weeks on end. In the long run, you save energy and eliminate the risk of burning the unit up in the process. There are several types of filters. There are washable filters which are removed, washed and allowed to dry before being put back into place. It is important that you follow the guidelines for washing and drying because a damp filter can allow mold and mildew to grow inside of the unit and defeat the entire purpose. There are also replaceable filters including the HEPA filter, odor filters such as activated charcoal and others, antibacterial treated filters and more. For a home with pets, HEPA filters and odor control filters are the most important. 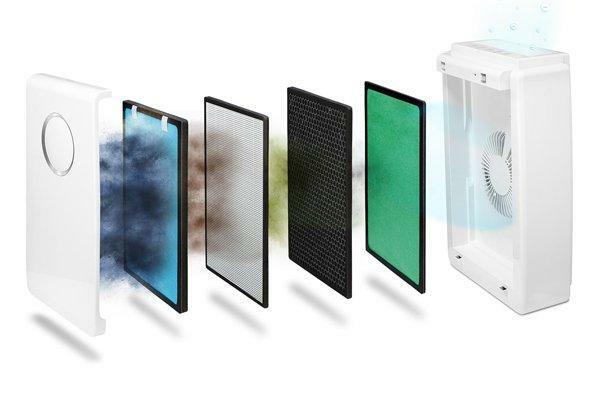 HEPA stands for: high efficiency particulate absorber. To meet the government recognized standards for this term, the filter has to absorb and clear the air of 99.97% of all allergens and airborne particles including pet hair, dander, mold spores and others. Some filters have rates at 99.99% while others that may use the term “HEPA-like” will have much lower rates. There are many companies that use the term without actually meeting the standards so always be aware of the difference between a true HEPA filter and one that is not. Setting a budget and sticking to it is important especially since there are so many air purifiers that are in the low to mid range that work as well as the higher priced units. If you are comfortable buying a name you have never heard of, that’s great but some people need to have the name recognition of a known brand. You will probably pay more for the name and not get any other benefits from it. Make sure that no matter which air purifier you do decide to buy that you can count on the company for service if it is needed and that you will be able to buy filters when it is time to replace them. When doing your research always make sure that you are checking to see if there are complaints about hard to find replacement filters, companies that never respond to their customers or other issues. Replacement filters should not cost more than the air purifier did and they should always be easy to replace. Most units have a cover in the front or back that swings open and the old filter pops out, the new one slides in with no tools needed. Pet owners spend billions of dollars on their pets every year. Part of that expense comes from trying to keep up with the dog hair, odors and other issues they bring in to the home. Even the healthiest, most well-groomed dog in the world will occasionally shed a bit and may even end up having a bit of doggy odor as well. An air purifier can help as long as it is chosen and used correctly at all times. It is important to remember that an air purifier is not magic and it will not clean the room of dog-sized clumps of hair nor will it help with the odor from a sick or poorly trained hound. However, a correctly sized, a multi-stage air purifier will help keep everyone breathing happily and more healthily and may help reduce the risk of allergic reactions from pet dander. Make sure that you look at the most important stats on any air purifier and keep in mind that by design there is going to be some level of noise especially during the early days when it is running at its highest speed. Decide how much noise is tolerable to you, what features that you absolutely need, set a budget and then work from there. One valuable feature you might consider is the air quality monitor. With this, you know exactly how clean or dirty the air you are breathing really is. Sleep mode, which turns the fan to the lowest setting and dims the lights for most units is a great suggestion for any air purifier that will be used in the rooms where people are going to be sleeping. You may find several options that fit your criteria or you may have to make some adjustments to fit your needs and stay in budget. Buy from a trusted seller, opt for higher filtration over other features and never settle for a unit that will only do a fair job if you can get one that will do a good to great one. Remember, clean air is one of the most important aspects of health for everyone in your family.